The need to represent knowledge about food is central to many human activities including agriculture, medicine, food safety inspection, shopping patterns, and sustainable development. 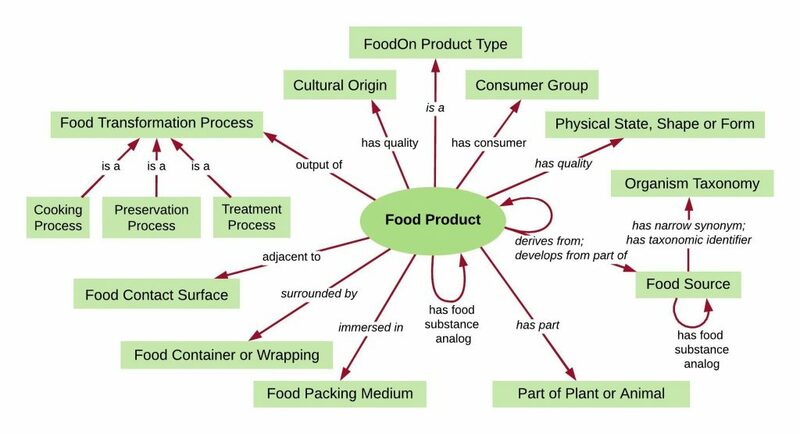 FoodOn is a new ontology built to interoperate with the OBO Library and to represent entities which bear a “food role”. Initially the ontology is focused on categorization and processing of food for humans, but in the future it will also encompass materials in natural ecosystems and food webs. We aim to develop semantics for food safety, food security, the agricultural and animal husbandry practices linked to food production, culinary, nutritional and chemical ingredients and processes. The scope of FoodOn is ambitious and will require input from multiple domains. FoodOn imports material from several ontologies covering anatomy, taxonomy, geography and cultural heritage. We aim to create content to cover gaps in the representation of food-related products and processes. This ontology is being applied to research and clinical datasets in academia and government. We also welcome industry uptake since agricultural and consumer devices connected to the Internet of Things will require a standard food vocabulary that has a global, multilingual reach. Curators and implementers can read up on FoodOn’s design details, and its GitHub repository and issue/term request board. Other discussion about design choices occurs in the FoodOn discussion group. Ways to incorporate portions of FoodOn into systems are described on the reuse page.